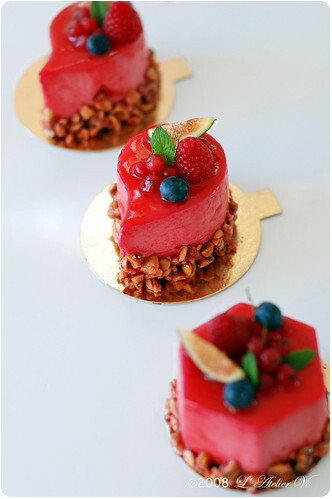 This delicate concoction features fresh, distinctive flavors combination of tart & fragrant raspberry and sweet basil gélée (I know, it's an unusual combination, but it worked so beautifully), silky creamy mascarpone mousse and tart raspberry mousse. It is a pure delight for the palette. 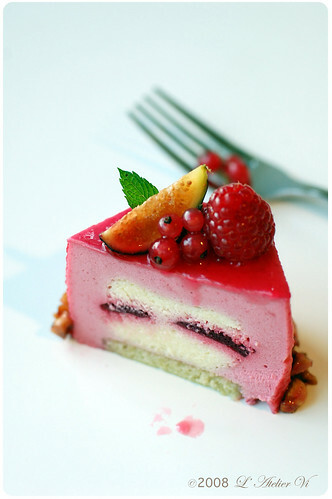 I would say the raspberry-sweet basil gélée definitely is the highlight of this petit gateau. I have been eager to give it a try since I read about this combo in a Japanese dessert trend magazine a while back. What an ingenious idea! 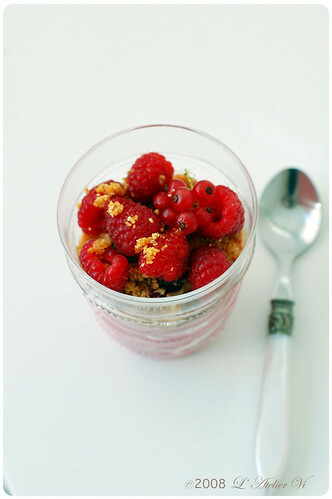 The steps go like this: make the raspberry-sweet basil gélée first and let set. Next, make the mascarpone mousse filling then add a raspberry-sweet basil gélée into each filling and let set. Put a cake base in each mousse moulds, pipe the raspberry mousse up to 1/3 of the height of the moulds. Take the mascarpone filling and push them into the mousse. Top the moulds with mousse and level them, and let set in the fridge. Decorate as you fancy. I admit that this may not be the easiest dessert to make, but the end result is worth every minute spent on making it! With some careful planning and patience, you’ll breeze right through it. If you wish, you may substitute raspberry purée with any fruits rouges (red fruits) like strawberry purée or red currant purée. I originally made this berry/mascarpone combo with strawberry purée for a friend’s engagement party and it was great. Also, I made the base out of hazelnut genoise, but almond sponge (biscuit joconde) goes well too. - To make the puree: in a bowl of a food processor, process 200g frozen raspberries and 1 pint fresh raspberries until soupy, pass through a fine sieve. This yields about 270g pure puree. 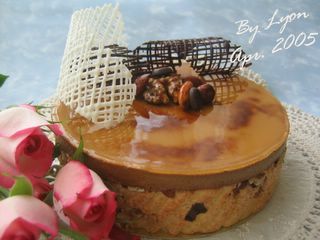 - Only prepare each mousse before using, as they get set fast. - It is critical not to over whip the cream. I used this recipe from before; however, I halved the recipe. Also, instead of using a round or square cake pan, I used a jelly roll pan. To give it more texture, once I spreaded the batter on the tray, I piped some wild berries jam on top in wavy lines. Once the cake cooled, stamp out the cake bases using the mousse mould. Soak the leaf gelatine in a bowl of ice water for a few minutes to soften it. Squeeze off excess water, set aside. In a food processor, process the raspberry purée and the sweet basil until fully combined. Pour the mixture into a mixing bowl then add the powdered sugar, lemon juice, and mix to combine using a rubber spatula. Place the pre-soaked gelatine in a heatproof bowl then add 2 tablespoons of the purée mixture and heat for 20 second in the microwave. Stir the mixture until completely dissolved before adding to the purée mixture. Stir to combine then add in the Crême de Framboise, mix well. Spoon into the moulds, and set in the fridge at least 3 hours or overnight. Bring 2 inch of water to a shimmer in a medium saucepan then remove from heat. Place the egg yolks, sugar, and the vanilla seed in a heat proof bowl then place the bowl over the simmer water (do not touch the water). Using a hand mixer, beat until pale yellow and slightly thickened. Add the pre-soaked gelatine, and mix well. Add the mascarpone next, beat for 30 second until combined. In a mixing bowl, whisk the whipping cream until soft peaks then using a rubber spatula, gently fold in 1/3 of the whipped cream to the mascarpone mixture, fold until combined. Fold in the remaining whipped cream and make sure the cream is fully incorporated. 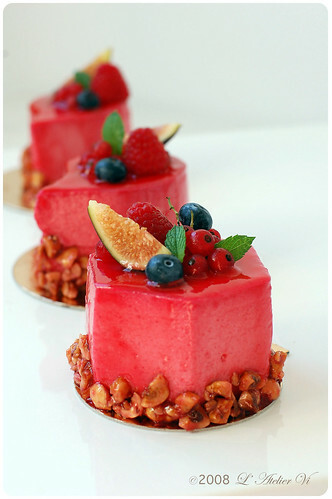 Pour into a piping bag, pipe into the moulds then take the raspberry –sweet basil gélée out from the fridge, remove from moulds, and push them into the mousse. Top the moulds with the remaining mousse and level them, then place in fridge to set for at least 3 hours or overnight. Combine 1/3 of the raspberry purée, and sugar in a saucepan and heat over low heat till sugar completely dissolved then remove from heat. Add in the pre-soaked gelatine and mix well. Add in the rest of the raspberry purée, mix until combined then add the lemon juice, Crême de Framboise, mix well. Set the saucepan in a cold water bath to cool. In a mixing bowl, whisk the whipping cream until soft peaks then using a rubber spatula, gently fold in 1/3 of the whipped cream to the cooled raspberry purée mixture. Fold to combine. Fold in the remaining whipped cream and make sure the cream is fully incorporated but do not over mix! Pour the mousse into a piping bag then set aside. Place the mousse moulds on a tray then put a cake base inside each mould. Pipe the raspberry mousse up to about 1/3 of the height of the moulds. Take the mascarpone mousse filling out from the fridge, remove from moulds, and push them into the raspberry mousse. Top the moulds with the raspberry mousse and level them, then place in fridge to set for at least 3 hours or overnight. Preheat the oven to 170C/340F. Line two baking sheet with parchment paper, spreads out the hazelnuts on 1 sheet, and set the other one aside, bake for 15 minutes. Remove from oven, let cool then chop the nuts into bites. Do not turn off the oven! Bring the purée and sugar to a boil over low heat, remove from heat then add in the chopped nuts. Using a rubber spatula, stirring to ensure the nuts are completely coated then pour into the prepared sheet. Spread it out and place into the oven, bake for 10 minutes. Let cool before use. Nappage is a neutral glaze use to add shine to pastry. I got it from here. In a saucepan, stirring occasionally, bring the purée, and sugar to a boil over low heat. Remove from heat, add the neutral glaze, and stir until completed combined. Pass the mixture through a fine sieve. Let cool before use. To unmold the cakes, wrap a hot towel around the mould for 10 second then use your fingers to push the cake upward, repeat this process with the rest of the cakes. Place a rack over a large shallow pan to catch the glaze drippings. Put the cakes on the rack, and with an icing knife in hand, pour the glaze onto the cake’s center. Move the knife over the top of the glaze to get a smooth and mirror-like appearance, allow the glaze to run down the sides of the cake. Patch any bare spots on the sides with the knife and let the cakes chill for15 minutes to set. 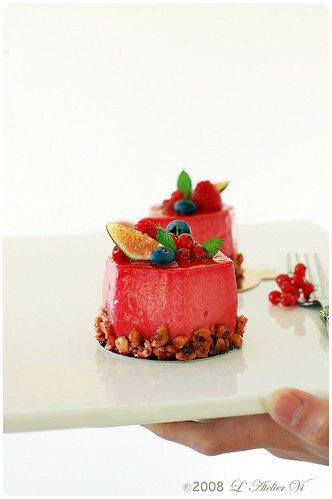 Garnish with the crispy at the cake base, and top the cakes with seasonal berries, and serve. WOW.. that's just awesome! Not only it look delicious, sound delicious but the photograph make it the WOW factor!!! 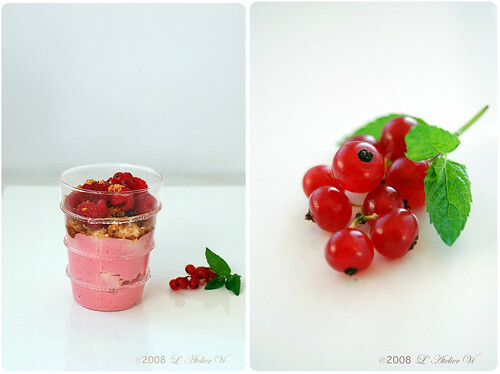 Will the baking process alter/rejoice/vitalize the one of a kind / fabulous taste of that little berry "紅醋栗"** ? Love the fibrant colours and the combination of flavours! Love this one! The inside shot of the cake is gorgeous! This is even beyond perfection! I'm out of words to describe how beautiful I think those individual cakes are! 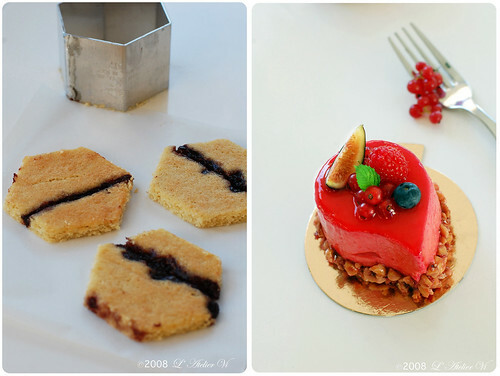 I also really love individual desserts, but usually don't have the patience to work on each one of them separately..
OH~~~~ simply tooooooo cute to eat!! another beautiful creation! I want a bite! Wow! I don't know how I've missed your blog, but I just found it and bookmarked it. Your creations and photos are amazing. Thanks for the inspiration. C'est tout simplement exquis et la couleur de cette mousse me fait rêver et les photos sont si magnifiques! !Je crois que votre talent devrait être récompensé! What a great looking dessert! well done! They are really divine! You really ought to open a artisan pastry. Each and everyone is just like an art display, not to mention the heavenly taste (well, I wish I can actually taste them). Oh, how I dream of opening my own shop! Still a long way before I make that dream come true though!